For those who do fly out of Chico, or at least consider it along with flights from other airports, reliability can be a key factor. How reliable are the flights from Chico? Subjectively, it probably depends on what your personal experiences have been. If you’ve flown from and to Chico, and have had generally positive experiences, then it’s likely you feel good about it. For example, the last time I flew out of Chico was in June 2012, connecting in San Francisco both ways with nonstops to and from Newark, N.J.. Everything worked flawlessly even though the connecting time in SFO on the return was brief. A month prior to that, a trip to Austin, Tex. also went smoothly. On the other hand my partner returned from Tampa in March, and due to a mechanical delay in Houston, what would have been generous connecting time in San Francisco evaporated and he missed the on-time departure of the flight to Chico. He had to wait five hours for the next Chico flight. For me, the ease and convenience of flying from and to Chico trump the possibility of delayed flights in most instances. But for others – business travelers in particular – it can be a deal breaker that leads them to use Sacramento exclusively. Looking at the comments the first post in this series has already received, the reliability question is critical, and I dare say that this chapter will generate further comments along the same lines. The reliability issue is more than just the usual stuff of weather/single-runway operations at SFO, mechanical delays, flow control (ATC delaying departures in the origin city to prevent congestion at the destination city), and flight cancellations; it is also inextricably linked to the lack of frequency of flights between San Francisco and Chico. Conversely, when I was flying frequently between Chico and Washington, D.C., the issue was insignificant because there were six flights between Chico and San Francisco. If a late flight to San Francisco caused me to misconnect with the flight to Chico, the next one didn’t require an excessively long wait. The Department of Transportation (DOT) has an amazing array of aviation statistics available on its website. For flight delay statistics this page shows all sorts of options for searches. Here’s one example: take a look at the Bureau of Transportation Statistics page for “Airline On-Time Statistics and Delay Causes”. Select “SkyWest Airlines Inc. (OO)” from the drop-down list, “Chico”, and then “January 2012” and “December 2012”. See example below for how the query should look. What is returned is a detailed synopsis with pie chart for arriving flights to Chico. On-time (within 15 minutes of the scheduled arrival) were 64.62% of flights. As to the reasons, the most common were late inbound aircraft (nearly 20%), air carrier delay (mechanical, etc. – 6.38%), and canceled flights (5.9%). No, Chico’s 64.62% isn’t very good, but nearby Redding scores even more poorly at 59.92% on-time. For comparison, Sacramento’s overall (all airlines) on-time performance last year was 83.67%, and SkyWest specifically there was 76.15%. Click on “See On-Time performance” and another window will appear. Reliability is crucial to creating more passengers dedicated to flying out of Chico. Whatever United and SkyWest can do to improve performance will be useful, whether it is establishing a longer minimum connecting time in San Francisco or setting guidelines for flight cancellations that are invoked as rarely as possible. There are things that the City, the business community, and interested members of the public can do to promote air service in Chico, but making the existing service more reliable – much more reliable – is in the hands of United and SkyWest. Yes, weather and other factors beyond the airlines’ control will always throw some curve balls, and flying out of Sacramento does not immunize a passenger to many of the same disruptions. But better processes to handle trouble, and perhaps judicious use of a standby aircraft and crew in San Francisco (to protect all of the cities served by SkyWest in northern California, not just Chico) would go a long way toward restoring the reputation of the service. Ultimately adding back frequency in the market will be the best hedge of all against unpredictability. I agree that more frequent flights would help. 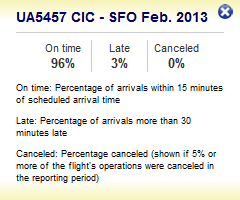 The first flight is always better unless/until there is flow control at SFO, which is typically in the morning. I DO fly out of.. and into Chico and have been “burned” more times than not. Add to this the absolutely ABYSMAL customer service from United it strains me to give them any of my dollars unless absolutely necessary. I would love to see how this would change if there were competition.